You're the boss! Don't feel like one of our prearranged tours are for you? Do you have a specific agenda for the flight? Perhaps you are a photographer, a geologist, a scout for upcoming ice cap crossings. We are there for you! We often get requests for individual routes from our customers. While having constructed tours that are ideal and aimed for sightseeing purposes covering the most impressive landmarks, we recognize that you might have have an interest in discovering other parts of Greenland from above, whether it's for the purpose of pure sightseeing or other tasks like surveying, photography etc. Previously we have done survey flights for scouts searching for hiking paths on the ice cap for future expeditions, starting from near our base in Kangerlussuaq, which is a popular starting point for ice cap crossing. Our most requested personal tours though, would have to be for professional photographers. Greenland draws a lot of attention to itself from photographers due to its unique diverse landscape, and the present global focus on the issue of global warming attracts photographers from all over the world wanting to illustrate the effects through the lens. The prices for our personal tours are charter based on an hourly rate. Please contact us for more information and let us know about your wishes. 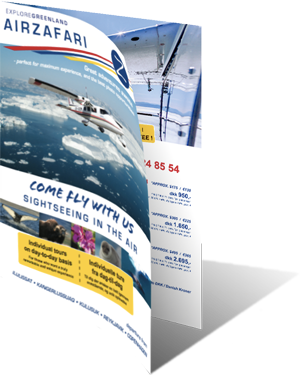 You are also very much advised to contact us if you are a larger company of guests or a representative thereof, who wish to do sightseeing flights in other parts of Greenland. We are able to relocate from our fixed bases in case the demand is high. In the recent years we have had big success doing flights with cruise ship guests, and the most recent new location for these activities has been Sisimiut, which has been just fantastic!